Powered by AHAVA’s Osmoter™,this Extreme Complex™ & Red Algae, Extreme Firming Eye Cream helps reduce wrinkles, significantly firms the delicate skin around the eyes, and improves skin's elasticity, providing a glowing, youthful and more lifted appearance. Significantly reduces the appearance of lines. Lends a youthful, radiant look to the eye area. 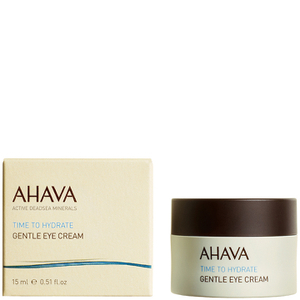 I've used (and liked) this Ahava product for several years. A sample of Philosophy Miracle Eye made me decide to try something new. It was awful. Within a week the skin under my eyes was a mess. There were wrinkles I had never seen before. It happened so fast, I decided a visit to my aesthetician made sense. She sold me a PCA under eye product which helped some but was still disappointing. So, back to Ahava I went. And the area under/around my eyes is, once again, smooth and comfortable. That was a ridiculously expensive lesson learned. This eye cream seems to leave a whitish residue around the eye, perhaps brightening the eye area to some, but for me it just looks unnatural. I don't notice any firming either. I always like to try new products for the eye area, just in case I find the "magic" one.. I always go back to this one, as it has done the best job for me so far. I always go by how my eye area looks in the morning when I wake up, after having applied the cream at night, and so far I have found nothing better when it comes to minimizing lines, wrinkles, tightness and dryness. I use it morning and night. This has been a pleasant surprise, this eye cream is the best! It goes on smooth and leaves your eye area nice and smooth. Truly is a winner you will not be sorry.